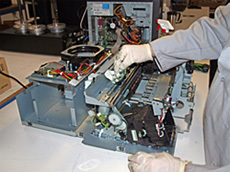 We fix Rimage CD Printers & Duplicators. Primera and Microboards, too. We charge $195 up front for the clean, test & advise fee for each disc duplicator and/or printer that is sent in for repair. We then contact you with a good faith estimate for the repair charges. If for any reason you choose not to proceed with the repair, we simply charge the $195 fee + shipping and send your system back to you. Ask for Mike Pfannenstein and fill out the form to the right to get started. Please take a moment to review the dos and don'ts of packing. Our technicians have extensive training and experience fixing, adjusting, cleaning, selling, and using all of the duplicators and printers we service. Our Repair Shop staff has over 20 years combined experience. If your duplicator or printer is not working right and you've been told that you can't get support for it, YOU CAN! Just pick up the phone and give us a call, you'll be glad you did. We warranty our work for 30 days. The parts used are purchased from the manufacture and whatever guarantees they have on their parts are transferred to you. Contact us for details as many parts have different warranty periods. Thermal printer printheads carry no warranty as the manufacturers consider these items to be consumables. 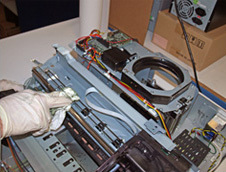 Typical repairs for the thermal based printers include: printhead installation and alignment (no warranty), bearing replacement, heater roller replacement, sensor replacement, take-up motor and bitmap board replacements. Typical repairs for inkjet based printers include: extensive cleaning, singulator adjustment and replacement, servo replacement, print engine replacement, print board replacement, print carriage adjustment and replacement. Typical repairs duplicators include: drive replacement, picker assembly replacement, singulator replacement, motor and belt replacement, firmware updates, etc. Below is a list of the printers and duplicators we fix on a regular basis. Contact us with any questions or if you have a model not listed below that you would like us to take a look at.